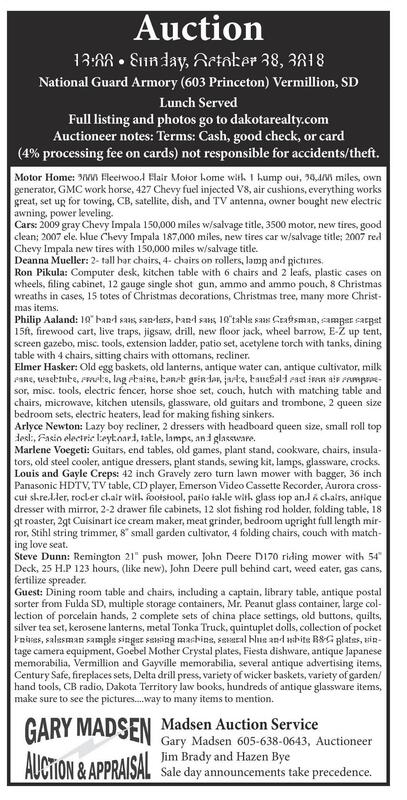 Wieman Land and Auction Company, Inc.
shop online at www.missourivalleyshopper.com October 23, 2018 • Page 7 AUCTIONS Home and Personal Property AUCTION Redfield Man Claims Sunday, Nov. 11 -- 12 noon $390,000 Lucky For Life Prize LOCATED: 305 W. 16th Avenue, Tyndall, SD (just east of St. Michael’s Hospital) PIERRE, S.D. — Christopher Whitley’s close proximity to the Appels Quick Shop in Redfield proved to be fruitful as he claimed the Lucky for Life lotto game’s second prize. Whitley claimed the game’s second prize of $390,000 Wednesday in Pierre. He has lived in Redfield his entire life and works across the street from Appels Quick Stop, which is where he purchased this winning ticket. Chris matched all five winning numbers and was just the Lucky Ball away from garnering the game’s top prize. Chris had the options of the $390,000 cash prize or $25,000 a year for the rest of his life. Although Whitley’s daily routine includes buying a ticket for that each night’s lotto game, Oct. 4 was a life-changing day. 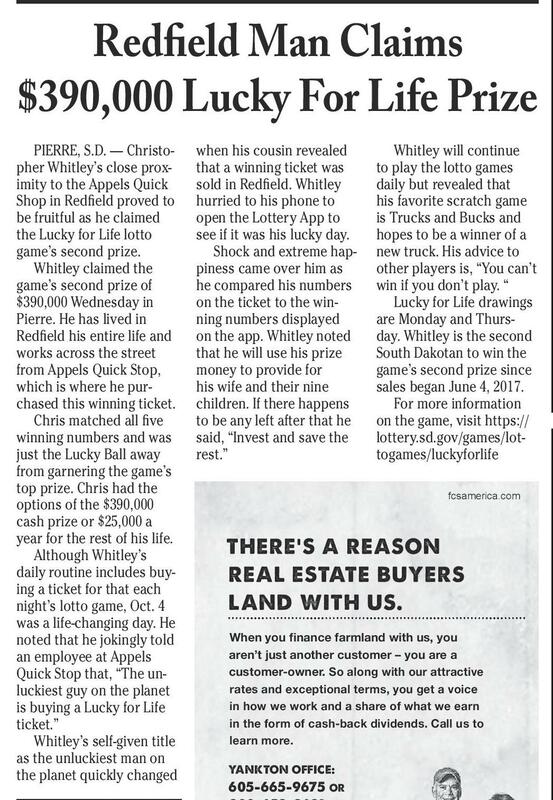 He noted that he jokingly told an employee at Appels Quick Stop that, “The unluckiest guy on the planet is buying a Lucky for Life ticket.” Whitley’s self-given title as the unluckiest man on the planet quickly changed when his cousin revealed that a winning ticket was sold in Redfield. Whitley hurried to his phone to open the Lottery App to see if it was his lucky day. Shock and extreme happiness came over him as he compared his numbers on the ticket to the winning numbers displayed on the app. Whitley noted that he will use his prize money to provide for his wife and their nine children. If there happens to be any left after that he said, “Invest and save the rest.” Whitley will continue to play the lotto games daily but revealed that his favorite scratch game is Trucks and Bucks and hopes to be a winner of a new truck. His advice to other players is, “You can’t win if you don’t play. “ Lucky for Life drawings are Monday and Thursday. Whitley is the second South Dakotan to win the game’s second prize since sales began June 4, 2017. For more information on the game, visit https:// lottery.sd.gov/games/lottogames/luckyforlife fcsamerica.com THERE’S A REASON REAL ESTATE BUYERS LAND WITH US. 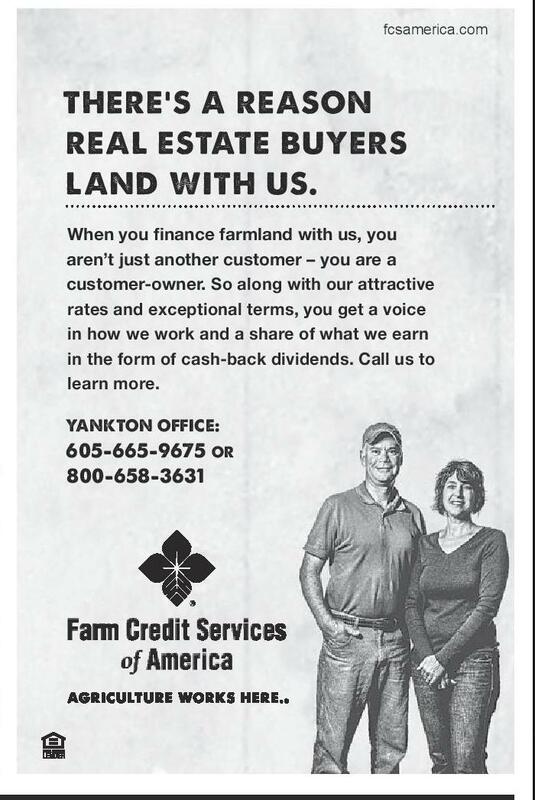 When you ?nance farmland with us, you aren’t just another customer – you are a customer-owner. So along with our attractive rates and exceptional terms, you get a voice in how we work and a share of what we earn in the form of cash-back dividends. Call us to learn more. YANKTON OFFICE: 605-665-9675 OR 800-658-3631 The right job is just one click away. REAL ESTATE consists of a 1040 sq. ft. 1 story, 2 bedroom home with 816 sq. ft. basement and 1 car detached garage. This cozy little home features a fuel oil furnace, central air, hot tub and 1 1/2 baths. Situated on a 69’x92’ lot this home has a great location close to the hospital and centrally located between school and business district. All major appliances included. LEGAL DESCRIPTION: Lots 7, 8, & E15’ of LOT 9 and W8” of North-South vacated alley and N8’ of East-West vacated alley, Block 25 Currier’s 1st Addition. TERMS & CONDITIONS: $5,000 non-refundable down payment day of auction with balance due at closing. Title Ins. and closing service fees will be split 50-50 between buyer and seller. 2018 Real Estate taxes will be prorated to closing based on 2017. Possession upon receipt of ?nal payment. Announcements day of the auction take precedence over promotional material. Peterson Auctioneers are representing sellers Personal property listing will appear in a later issue. Robert & Magdeline Bame, Owners Peterson Auctioneers Glen Peterson, RE #234 www.petersonauctioneers.com Lee Wittmeier - Tyndall, SD Cody Peterson - Avon, SD Wildlife Art, Sports Memorabilia, Collectibles, Household AUCTION Saturday, Nov. 3 -- 11 a.m. LOCATED: NFAA Easton Yankton Archery Center, 800 Archery Lane, Yankton, SD Doors open at 9:30 a.m. - Wildlife Paintings and Prints will be sold at 12 noon Online bidding will be available via Proxibid WILDLIFE PAINTINGS AND PRINTS: 20 + Terry Redlin Prints, several artist proofs and low numbered limited editions; Mark Anderson original paintings and prints, several artist proofs and low numbered limited editions, some with printing rights; Set of two mallard prints painted in cooperation by Mark Anderson and John C. Green, artist proofs, both numbered 167/400, rare set; Several other prints by John C. Green, Jim Hansel, Ken Zylla, Joshua Spies, R.J. McDonald, Daniel Smith, as well as several other beautiful prints from various local and regional artists; Several DU prints; These pieces have all been professionally framed and very well taken care of. SPORTS MEMORABILIA: Several 49ers prints by Armando Delgado and Daniel Smith, several autographed by Joe Montana, Jerry Rice, Ronnie Lott, as well as other players, several with certi?cates of authenticity; Olympic memorabilia; Nebraska Cornhuskers items as well as much more sports collectibles ANTIQUES AND COLLECTIBLES: Terry Redlin collector’s edition plates; Several wildlife mounts; large collection of wildlife statues and ?gurines; wildlife decanters; Native American statues and art; collection of LLADRO statues; Frankoma; Grandfather clock; mantle clock; large assortment of lead crystal; large amount of miscellaneous paintings of every description; small crocks; painted glass décor; lots of miscellaneous plates and décor; decorative lamps; collectible glass including depression; miscellaneous reproduction signs and much more MISCELLANEOUS: Display cases; book shelves; glass shelves; loveseat; arm chairs; hutch; ?shing rods and reels; Cub Cadet s.p. push mower; Snap On pressure washer; patio furniture; cordless and electric power tools; red wagon; shop vac; ladder; miscellaneous hand tools; canvas and folding chairs; gas cans and many more household and lawn and garden related items JACK MANSFIELD, OWNER www.missourivalleyshopper.com In Print and Online! Call 665-5884 Peterson Auctioneers Glen Peterson, RE #234 235.47 ACRES OF DANVILLE TOWNSHIP TURNER COUNTY LAND!! • AT AUCTION • THURSDAY, NOVEMBER 1ST • 3:00 PM Here is an excellent opportunity to acquire 235.47 acres of, all contiguous, tillable & hunting land located in a tightly held area of Turner County! This farm runs ¾ of a mile long with a nice mix of CRP, tillable and grass land. The property has been utilized as a hunting preserve since 1999 and is an excellent hunting setup only 45 minutes from Sioux Falls! The new buyer will receive immediate hunting rights on auction day. If farming is in your plans, there are 98.5 acres on Tract 1 that is ready to farm in 2019 and you can continue to add acres into your operation as the CRP contracts expire. This farm has great soils and would make an excellent addition to any producer or investor. Property Location: From Irene, SD on Hwy 46 go 1 mile east to the SW corner of the property (the hunting lodge), then go ½ mile further east to 454th Ave. and head north to view the eastern edge of the property. Watch for signs! Property will be sold on the gravel road (454th Ave.) towards the north end of the property. TRACT #1 – 155.47 ACRES This tract consists of 155.47 +/- acres of quality farm land with a heated 30’ x 40’ garage/hunting lodge in the SW corner of the property along Hwy 46. This improvement makes for a great day lodge with a kitchen, bathroom, and cleaning station after the hunt! According to the FSA, this tract has approx. 129.86 acres tillable with 31.36 acres enrolled in CRP for an annual payment of $5,326. The 31.36 acres of CRP are enrolled in 4 CRP contracts that expire in 2022, 2025, & 2026. Approximately 98.5 Acres of CRP expire on 9/30/2018 and will be eligible for row crops in the 2019 crop year. The balance of this land is in grassland, trees, and RROW. Predominant soil types are Egan-Ethan complex and Egan-Wentworth complex that carry a productivity index of 74.5. The current assessed value is $417,910 and 2017 RE taxes are $3,836.54 LEGAL: The SE ¼ (less acreage & highway) in Section 32-96-53, Turner County, SD. TRACT #2 – 80 ACRES This tract consists of 80 +/- acres of quality farm land. According to the FSA, this tract has approx. 79.84 acres tillable with 100% of the tillable acres enrolled in CRP for an annual payment of $14,024. This tract is enrolled in 2 CRP contracts that expire in 2023 & 2025. Predominant soil types are Egan-Ethan complex and Egan-Wentworth complex that carry a productivity index of 71.2. The current assessed value is $206,190 and 2017 RE taxes are $1,846.46 LEGAL: The S ½ NE ¼ in Section 32-96-53, Turner County, SD. TRACT #3 – 235.47 ACRES Combination of Tracts 1 & 2, all contiguous tract of 235.47 acres, which is very hard to find in Turner County, with a nice balance of CRP tillable and grassland. This is a great opportunity for , any hunter, cattleman, farmer, or investor. TERMS: Cash Sale with a 10% non-refundable down payment on sale day and the balance on or before January 25, 2019. A warranty deed will be provided. Title insurance utilized with the cost of Owner’s Policy split 50/50 between buyer and seller. Seller to retain all the 2018 CRP/ rental income. New buyer will receive hunting possession on auction day with full possession on January 25, 2019, at closing. Seller will pay the 2018 RE taxes due in 2019. New buyer will assume all current CRP contracts. Sold subject to the owner’s confirmation and any easement of record. Wieman Land & Auction Co., Inc. is representing the sellers in this transaction. If a land purchase is in your plans – please check out these great tracts. We invite you to view this parcel of land at your convenience. Feel free to walk out and around the property. This is definitely a wildlife sanctuary! 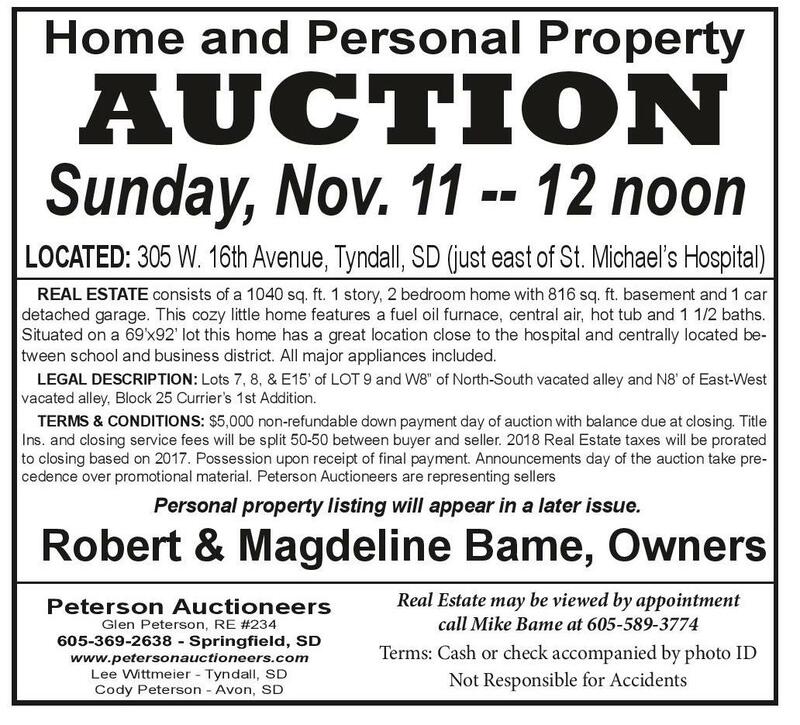 For an information packet, go to www.wiemanauction.com or contact Ryan Wieman @ 605-366-3369 or Bob Graff @ 605-760-0283 for more details. Auction will be held on the land. Come prepared to buy! GRAFF FARMS, INC - OWNER Bob Graff, Pat Clark, Cathy Sorenson, & Ron Graff Estate Wieman LandSD& Auction Co.57043 (since 1949) Inc. 44628 HIGHWAY 44, MARION, SD AUCTION OFFICE: 800-251-3111 or 605-648-3111 MACHINERY OFFICE: 888-296-3536 or 605-648-3536 Email: Info@WiemanAuction.com Real Estate may be viewed by appointment call Mike Bame at 605-589-3774 Terms: Cash or check accompanied by photo ID Not Responsible for Accidents Website: WiemanAuction.com EVENINGS: Ryan Wieman 605-366-3369, Kevin Wieman 605-660-1587, Rich Wieman 605-660-0341, Derek Wieman 605-660-2135, Mike Wieman 605-351-0905 www.petersonauctioneers.com Lee Wittmeier - Tyndall, SD Cody Peterson - Avon, SD Terms: Cash or check accompanied by photo ID Not Responsible for Accidents Auction 12:00 • Sunday, October 28, 2018 National Guard Armory (603 Princeton) Vermillion, SD Lunch Served Full listing and photos go to dakotarealty.com Auctioneer notes: Terms: Cash, good check, or card (4% processing fee on cards) not responsible for accidents/theft. Motor Home: 2000 Fleetwood Flair Motor home with 1 bump out, 29,400 miles, own generator, GMC work horse, 427 Chevy fuel injected V8, air cushions, everything works great, set up for towing, CB, satellite, dish, and TV antenna, owner bought new electric awning, power leveling. Cars: 2009 gray Chevy Impala 150,000 miles w/salvage title, 3500 motor, new tires, good clean; 2007 ele. blue Chevy Impala 187,000 miles, new tires car w/salvage title; 2007 red Chevy Impala new tires with 150,000 miles w/salvage title. Deanna Mueller: 2- tall bar chairs, 4- chairs on rollers, lamp and pictures. Ron Pikula: Computer desk, kitchen table with 6 chairs and 2 leafs, plastic cases on wheels, filing cabinet, 12 gauge single shot gun, ammo and ammo pouch, 8 Christmas wreaths in cases, 15 totes of Christmas decorations, Christmas tree, many more Christmas items. Philip Aaland: 10" band saw, sanders, hand saw, 10"table saw Craftsman, camper carpet 15ft, firewood cart, live traps, jigsaw, drill, new floor jack, wheel barrow, E-Z up tent, screen gazebo, misc. tools, extension ladder, patio set, acetylene torch with tanks, dining table with 4 chairs, sitting chairs with ottomans, recliner. Elmer Hasker: Old egg baskets, old lanterns, antique water can, antique cultivator, milk cans, washtubs, crocks, log chains, bench grinder, jacks, hausfield cast iron air compressor, misc. tools, electric fencer, horse shoe set, couch, hutch with matching table and chairs, microwave, kitchen utensils, glassware, old guitars and trombone, 2 queen size bedroom sets, electric heaters, lead for making fishing sinkers. Arlyce Newton: Lazy boy recliner, 2 dressers with headboard queen size, small roll top desk, Casio electric keyboard, table, lamps, and glassware. Marlene Voegeti: Guitars, end tables, old games, plant stand, cookware, chairs, insulators, old steel cooler, antique dressers, plant stands, sewing kit, lamps, glassware, crocks. Louis and Gayle Creps: 42 inch Gravely zero turn lawn mower with bagger, 36 inch Panasonic HDTV, TV table, CD player, Emerson Video Cassette Recorder, Aurora crosscut shredder, rocker chair with footstool, patio table with glass top and 6 chairs, antique dresser with mirror, 2-2 drawer file cabinets, 12 slot fishing rod holder, folding table, 18 qt roaster, 2qt Cuisinart ice cream maker, meat grinder, bedroom upright full length mirror, Stihl string trimmer, 8" small garden cultivator, 4 folding chairs, couch with matching love seat. Steve Dunn: Remington 21" push mower, John Deere D170 riding mower with 54" Deck, 25 H.P 123 hours, (like new), John Deere pull behind cart, weed eater, gas cans, fertilize spreader. Guest: Dining room table and chairs, including a captain, library table, antique postal sorter from Fulda SD, multiple storage containers, Mr. Peanut glass container, large collection of porcelain hands, 2 complete sets of china place settings, old buttons, quilts, silver tea set, kerosene lanterns, metal Tonka Truck, quintuplet dolls, collection of pocket knives, salesman sample singer sewing machine, several blue and white B&G plates, vintage camera equipment, Goebel Mother Crystal plates, Fiesta dishware, antique Japanese memorabilia, Vermillion and Gayville memorabilia, several antique advertising items, Century Safe, fireplaces sets, Delta drill press, variety of wicker baskets, variety of garden/ hand tools, CB radio, Dakota Territory law books, hundreds of antique glassware items, make sure to see the pictures....way to many items to mention. Madsen Auction Service Gary Madsen 605-638-0643, Auctioneer Jim Brady and Hazen Bye Sale day announcements take precedence.